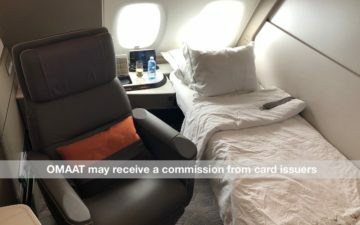 In each of the other regions we’ve discussed, there have been lie-flat business class award options via Chase Ultimate Rewards transfer partners. However, if you’re planning a trip to the Caribbean, Central America or Mexico, you will rarely find these wonderful seats. That’s okay, though. Many of these flights won’t be that long so recliners in domestic first class won’t be so bad. In fact, even if you generally prefer business class, economy might work for you on some of these routes. As you’ll see below, a couple variables will determine your best options. This might mean booking through the Chase travel portal or with cash instead of transferring to an airline partner. As a reminder, there are many options to accrue Ultimate Rewards. With that in mind, let’s check out your best award booking options with Ultimate Rewards points to the Caribbean, Central America, and Mexico. Flying Blue’s revamp of its award program on June 1, 2018 hurt redemptions to the Caribbean, Central America and Mexico. However, with Chase Ultimate Rewards points, it’s your only SkyTeam option now that Korean Air SkyPass has ended its partnership with Chase. If there is any silver lining, it’s that you won’t get hit with big surcharges on these awards as you will with many Flying Blue awards. You’ll definitely want to confirm rates before transferring Ultimate Rewards points — you should always be doing this — to make sure you don’t get a bad redemption rate. You can run a flexible date search with Air France or KLM to see if saver award space is available on dates you can travel. Once you find space, you can book online or call (1-800-375-8723) to put an award — might take a couple of calls to get a friend phone agent. Transfers from Chase Ultimate Rewards (1:1 ratio) generally process almost instantly. When you consider Flying Blue’s issues with “fraud prevention”, we generally recommend calling to hold an award before transferring. Once that’s complete, you can call to have the ticket issued and pay the taxes/fees with a credit card in the account holder’s name. As distance-based award charts go, British Airways is definitely one of the most used. If you choose to use British Airways Avios, you need to remember that awards are price per segment. If you have an award with one connection, that means you’ll need to add the Avios required for the first segment and the second segment to get your total. While this can be frustrating, it does mean you can include a stopover on the route quite easily. Personally, I generally prefer a better redemption rate so you might want to consider using Iberia Plus if you have a connection — more on that below. When booking flights on Oneworld partner American Airlines, flights from the U.S. will not fall under Zone 1 of the award chart even if they’re no more than 650 flight miles. This means flights up to 1,150 flight miles will require 7,500 Avios. If you can book one of British Airways’ fifth freedom flights I mentioned above, the off-peak rate is only 4,000 Avios for a one-way economy award. When you consider the cash fares on these routes, even the peak rate of 4,500 Avios is a great value. British Airways has one of the better Oneworld award search platforms so for flights on American or British Airways, you should be able to search and book online without too much trouble. Occasionally, you’ll run into search errors but this is usually fixed by logging out and back in or switching browsers. It’s annoying but shouldn’t take too much time out of your day. If you want to book flights on Alaska Airlines, which can be an interesting option from the West Coast, you’ll have to call British Airways to ticket. Once you find the space you want, you can transfer Ultimate Rewards points at a 1:1 ratio and expect the transfer to process almost instantly. While you can get the same rates with Singapore KrisFlyer miles, United often releases more award space on its own flights to MileagePlus members — particularly elites and those with a co-branded credit card. Unfortunately, United considers the Caribbean, Central America and Mexico as separate regions so you can’t use the Excursionist Perk between them on a round-trip award. Flying to these regions, you might find yourself on Air Canada, Copa Airlines or United though most flights will be on the latter. While booking with United can be quite frustrating, you can take solace in the fact that United has a solid flexible date search option that allows you to see whether there is economy and/or premium cabin award space across two months. The biggest downside is that United will only allow you to book the results they spit out so you can’t piece together an itinerary. Fortunately, Ultimate Rewards points transfer to United almost instantly at a 1:1 ratio so you won’t have to worry too much about award space disappearing. Before you book with one of the above options, I’d take a look at one of the following just in case one of them can help you save some Ultimate Rewards points. It’s not uncommon to find decent cash fares to the Caribbean, Central America or Mexico which make booking award flights a pretty poor value proposition. In these cases, I’d suggest one of two things: pay cash — well, credit card — or use your points through the Chase travel portal. If you have Ultimate Rewards points and the ability to transfer your points to airline partners, that means you have at least one of the following: Chase Sapphire Reserve®, Chase Sapphire Preferred® or Ink Business Preferred℠ Credit Card. In the portal, you’ll get 1.5 cents per point with the Sapphire Reserve while the Sapphire Preferred and Ink Preferred both allow you to redeem at 1.25 cents per point. With a good cash fare, you can save points by booking this way. Iberia Plus is a fun option if you want to fly American Airlines but need a connecting flight. Like British Airways, it’s part of the Avios program but it has a different award chart. Rather than calculating awards by segment, Iberia determines the award rate by the total flight miles. This can help you save some Ultimate Rewards points when booking conections on American. If you were to fly from Orlando (MCO), connect in Miami (MIA) on your way to St. Kitts (SKB), you would need 28,000 Iberia Avios for a round-trip award in economy. If you were to book with British Airways Avios, you’d need an additional 7,000 Avios for a total of 35,000. If you choose to book with Iberia, please remember that flights on American Airlines must be booked as round-trip awards and cannot be changed for refunded — this goes for all Iberia partner bookings. Chase Ultimate Rewards points transfer to Iberia Plus at a 1:1 ratio and generally process within a day or two. Flying Club really has one use for awards in this case and that’s non-stop business class flights on Delta. Other than that, you’re better off using Air France-KLM Flying Blue. 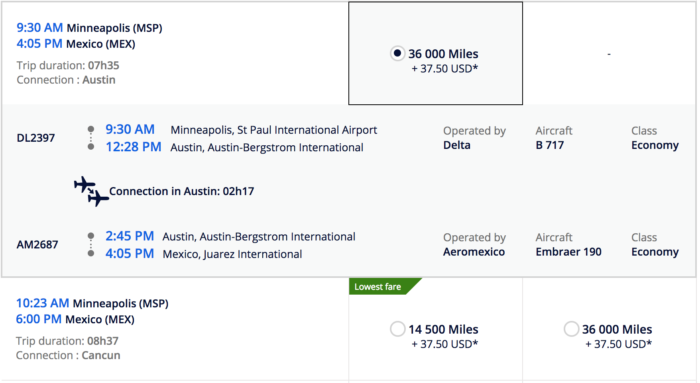 A one-way business class award on Delta will cost you 30,000 miles but connections will add to the miles required. While Flying Blue will require several thousand miles more, you can include connections at the same rate so this option with Virgin Atlantic is quite limited. When searching for award space on Virgin’s site, you might have to click the teardrop pin in the destination field to select your destination from the dropdown menu. You can expect to do this if Virgin doesn’t fly to a destination itself. You’ll then need to choose to Pay with Miles before running the search. I suggest selecting to do a search for flights within 5 weeks to see all possible dates near your ideal travel date. If Virgin won’t let you run an award search, change the destination to London Heathrow (LHR) then select Pay with Miles before changing the destination to what you really want. When you’re ready to book, you can call Virgin Atlantic (1-800-365-9000) to hold the award space. You can then transfer Ultimate Rewards points at a 1:1 ratio and expect the transfer to process almost instantly. As I mentioned in the Membership Rewards version how to fly to the Caribbean, Central America and Mexico, these trips won’t be about the flights. Instead, the destination will clearly be the driver on this one. There’s nothing wrong with that though! There are tons of beautiful places to visit and, while the flights won’t be ones to remember, you have plenty of ways to redeem Ultimate Rewards points to get there. How have you used Ultimate Rewards points to fly to Mexico, Central America, or the Caribbean? Heathrow Is Now Selling Fast Track Security Passes – But Is It Worth It? Has OMAAT done one of these types of posts for Amex Membership Rewards Points? Book the first segment first class which is prorated based on mileage and typically about only ~1k miles and get MCE FREE for the second longer segment. My favorite trick, and one I was hesitant to share.